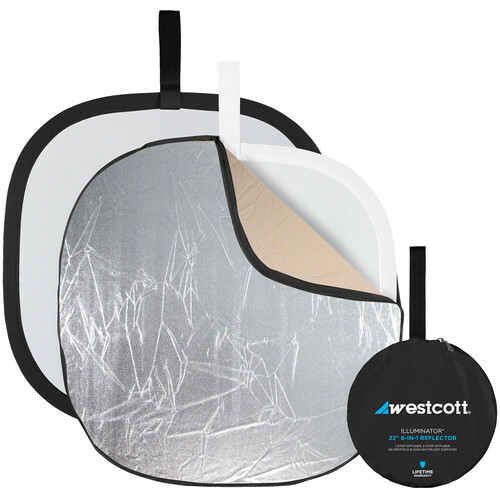 The Westcott 20", 6 in 1 Illuminator Reflector Kit allows changing of the reflective surface by simply zipping on a cover. The kit comes with one two-stop diffusion panel that also serves as reflective white and a reversible zippered cover of silver, gold, sunlight and black surfaces. This size is suggested for a head shot portrait. Box Dimensions (LxWxH) 9.85 x 9.8 x 4.2"
Illuminator Reflector Kit 6-in-1 (20") is rated 5.0 out of 5 by 2. Rated 5 out of 5 by Doug D. from Works really well!!! I have a larger set of reflectors/diffusors but I really needed this smaller size to work with some table top photography. In taking pictures of flowers, small items, etc. these reflectors/diffusers work just right!!! That are easy to hold or to put on a stand. I've found them easy to use and they fold up small enough that they don't take up much room in your bag. Rated 5 out of 5 by timelessnomad from Very Useful and Very Compact I am new to lighting and bought this to start learning how to manipulate my images pre computer. So far so good. Very happy with this product.